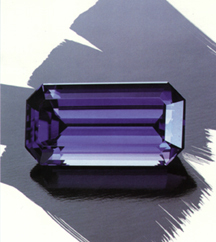 The soft, almost liquid, violet-blue hue of Iolite is sometimes referred to, in error, as "water sapphire: ' Though not a Sapphire, Iolite derives its name from the Greek word ios meaning violet. Iolite's most distinctive characteristic is its pleochroic property, which is the display of different colors when viewed from different directions like a modern-day polarized filter used in sunglasses. As with all gemstones, protect your Iolite from scratches and sharp blows. Clean your Iolite jewelry by immersing it in lukewarm soapy water and using a small, soft brush or a home ultrasonic, steam or jewelry cleaner. While today we are not limited by tradition, the symbolism of Iolite is treasured as a gemstone to celebrate one's twenty-first anniversary.